Diarrhea, constipation, flatulence, vomiting, and gastro-enteritis are occasional irritants affecting all pets and people from time to time. But for some patients, these problems and other bowel diseases like colitis, irritable bowel syndrome, viral enteritis, and reflux can be either very serious ... or cause long term problems that can make your pet miserable. And it's no fun to be the owner of pets with chronic bowel problems either. And sometimes the medications we use to treat other problems in your pet cause gastro-intestinal irritation. Having intensely itchy skin, a tooth abscess, or an ear infection is probably worse than having chronic gut discomfort, but it's still awfully hard to feel good when your gastro intestinal tract is torn up. We talk about therapeutic intestinal diets on another page, but we sometimes use Royal Canin HE for just a week or two as a treatment for intestinal flare ups, so I've included it on this page about supplements as well. I'm not quite sure why this high energy diet works so well at helping pets with diarrhea and inflammation of the bowel but it does. This diet is amazingly effective as a treatment as well as a long term diet for pets with frequent GI problems. 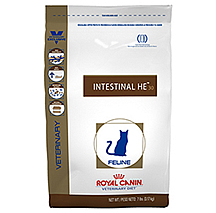 Royal Canin HE is available in dry and canned for both dogs and cats. Digest-Rite is often effective for chronic diarrhea, gas, and other inflammatory bowel diseases. It contains digestive enzymes (amylase, protease, cellulase, lipase, and pectinase) that break down fats, starches, and proteins ... something that most pets do naturally but something that a lot of pets don't do well ... especially after middle age sets in. And it also contains beneficial amino acids, Yucca schidigera, and probiotics (Lactobacillus acidophilus, Enterococcus faecium, Bifidobacterium thermophilum and Bifidobacterium longum, and Bacticillus subtilus), all of which reduce bowel inflammation, gas, aid in various digestive disorders and often stops stool eating. And even helpful with weight problems. Disgest Rite is a flavored powder you spoon over your pet's food once a day. There are lots of digestive aids containing probiotics, and the higher quality products seem to be beneficial in a lot of cases. But I think the reason DigestRite solves chronic indigestion and gastro intestinal problems in so many dogs and cats is not because of the probiotics in the formula, but rather because it contains enzymes that break down starches, proteins, and fats in the upper intestine. This keeps poorly digested food from fermenting and causing so much gas and discomfort in the lower bowel. 2. Regulate and increase hormone levels needed for good digestion. Several things can destroy the intestinal bacterial balance in a pet’s gut. Antibiotics and other prescription medications may destroy good bacteria as well as bad. Stress, poor diet, pollutants in the air, water, and environment may also deplete beneficial bacteria. And at the most recent lecture I attended (Arpil 2014) on bowel diseases, the professor (Dr. Mike Willard of Texas A&M), we were told that the real problem in a lot of cases is that the pet's immune system is simply not working well enough to keep the NUMBER of bacteria under control. Probiotics can play a helpful role in keeping the bowel healthy, but in truth, clinical results are often disappointing. Part of the reason is that most probiotic products sold for people and pets ... it's a huge, unregulated industry... are nearly worthless either because what's in the product is not even close to what's on the label, or more commonly, because to be effective the lactobacillus and other organisms in the product need to be active (think yeast if you bake bread or cakes) and it takes extremely good quality control and packaging to keep the culture active. So, if you're going to try a probiotic product for a few weeks to determine whether or not is helps your dog or cat, spend the extra money to buy a quality product from a reputable company. 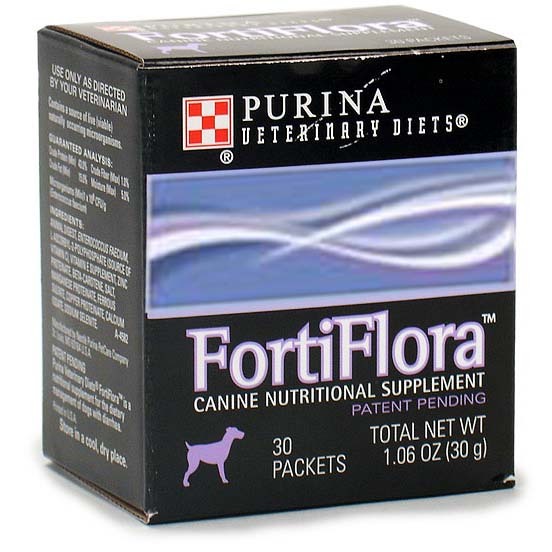 I gather from the lectures I attend that Purina FortiFlora is the brand most used by internal medicine departments of many veterinary colleges. One of the clues that this is a first rate probiotic culture is that the daily doses are individually wrapped for freshness. And that when you open the packet, it has a yeasty odor. The other clue is that I have quite a few pet owners return to buy more because it works. This unique supplement contains live active cultures and is recommended for the dietary management of dogs with frequent diarrhea or other bowel problems. It tastes great and can be easily sprinkled on a dog's or cat's food. Dr Lapin of Colorado State Veterinary School says it also helps cats fight off upper respiratory disease because of it's beneficial effects on the immune system. At any rate, like a lot of things in life, there needs to be a balance in the gi tract in regards to the type and amount of bacteria in the bowels. And DigestRite and high quality probiotics often help achieve this balance. But another thing that needs to be kept in careful balance is the amount of moisture in the bowel. Too much leads to diarrhea. Too little leads to constipation or straining. This is where dietary fiber or supplemental fiber can really help. 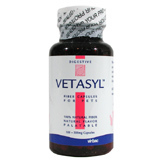 Fiber supplements like Vetasyl: The right amount and right type of fiber in the diet can be very helpful in treating pets prone to diarrhea as well as pets prone to constipation. This is because fiber helps regulates the amount of moisture in the bowel... Not too much and not too little. And quite frequently, instead of supplements, we recommend special, prescription diets designed for cats and dogs with "sensitive stomachs". It's remarkable how many pets become normal on these special diets ... and then when the owner goes back to using another pet food.... the problems return. I discuss the benefits of "sensitive stomach" therapeutic diets on another page Check it out. 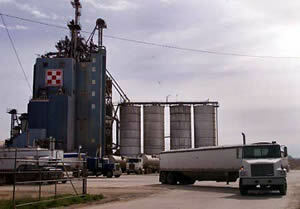 I've also writen a page about the pet food industry that might shock or at least surprise you. The AnimalPetDoctor site is devoted to discussing how I treat different medical problems and there is a much more in depth discussion about the causes, dignostics, and treatment of intestinal problems there. And in addition to the interesting page about the pet food industry mentioned above, I've written quite a bit about the history of veterinary medicine, about women in our profession, and also about the "Human Animal Bond". Oh, I forgot... one more thing. 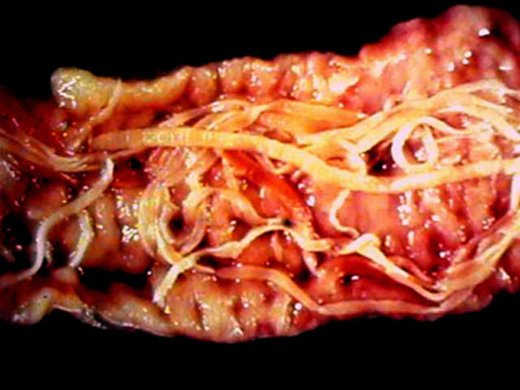 Intestinal parasites are still a frequent cause of poor intestinal health. Don't forget to check for parasites at least once a year. And don't assume that just because you're using a monthly preventive that is supposed to control intestinal worms that it is working well.... many worms have become resistant to some deworming products. This page is about the products and supplements we recommend for pets with frequent diarrhea, colon cramps or discomfort, constipation, gas, and other GI problems. Also for pets that need to take medication whether short term or long term that might cause bowel inflammation. These include many antibiotics, steroids, pain medications, and phenobarbital. Note; when you're using petroleum jelly based hairball medications, ignore the directions on the package... the trick to effectively evacuating the bowel is to use A LOT. talk to me about how much I recommend.